Home | Valentine’s Day is almost here and we need to talk! Valentine’s Day is almost here and we need to talk! Low cocoa prices are pushing cocoa farmers in West Africa to desperate measures. For example, in Côte d’Ivoire, cocoa farmers earn just $0.50 per day. That’s in a region where poverty is defined as $2 per day and “dire poverty” is $1.25 per day. Desperate to earn any income possible, even children are pressed into hard work and forced labor is also common. In Ghana and Côte d’Ivoire alone, an estimated 2.1 million children work dangerous jobs and hours that interferes with their schooling—and that number is going up not down, according to recent studies. Low prices force farmers to do anything, including expanding into surrounding forests, to make ends meet. Meanwhile, big chocolate companies have turned a blind eye to the deforestation that ensues, for example, Côte d’Ivoire has lost 85% of its forest in the past two decades. That has huge consequences for our climate as well as the people and animals that live there. Nearly 80% of the cut flowers sold in the U.S. are imported, mostly from giant operations in Colombia and Ecuador. Nearly two-thirds of those workers are women, suffering long hours, repetitive injuries, exposure to hazardous chemicals, and often sexual harassment and discrimination too—hardly the ingredients for a gift of love! Those long-stemmed roses have a colossal global impact. Grown in indoor greenhouses, irrigated, refrigerated and flown around the globe, that bouquet has a massive carbon footprint. On top of that, these intense monocrops require lots of chemicals to keep them growing, about 20% of which are so toxic that they are banned in the U.S. and Europe. But your Valentine’s Day gifts don’t have to exploit people and the planet! Look for fairly traded organic and local treats to express your feelings and spread the goodness a little further afield. 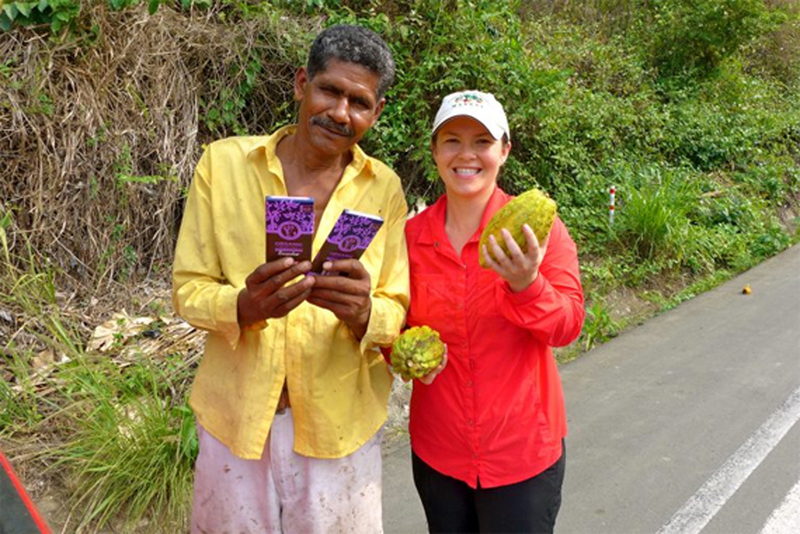 Choose fair trade, organic chocolate. Our guide to the companies leading the way in supporting small-scale farmers is here. Bars, truffles, and other treats—there’s no need to sacrifice taste. Look for brands committed to doing the right thing in all their supply chains. While the big companies struggle to slow deforestation and end the worse forms of abuse, companies like Alter Eco and Equal Exchange are partnering with producers on reforestation and agroforestry projects, going beyond the minimums to build a better world. Pick something greener than a bouquet of roses. Choose locally grown flowers if they are available near you in February. Living plants will be a long-lasting reminder, whether they stay in the house or get the garden started. Fair trade flowers are also available, yet while they are better for people, their environmental footprint is still enormous. Cancel fresh flowers and bring home the sweet smells of fair trade, organic body products from companies like Alaffia and Dr. Bronner whose natural products are supporting communities around the globe. Fair trade artisans around the globe are blending traditional designs with new looks to create selections that should suit anyone on your list. Companies like Matr Boomie and Aid Through Trade have a long history of partnering with craftspeople to create beautiful pieces—no blood diamonds involved. Nothing says you care like finding a fair trade version of your special someone’s favorite treat. From tea to olives to greeting cards—there are plenty of options to choose from. Get inspired here. How are you showing you care this Valentine’s Day? what partners do you have in Australia? sydney and other states? No one supports Valentines to aid and abet an abusive economic system. The prob;lem is not what is described here. This is the end result. The soultion is to require a free market having large numbers of nuyers and sellers. That can only be accomplished by ending vertical and horizontal integration of the process that inexorably leads to a cartel that then is wasteful and abusive to people around the world. Most holidays (especially in U.S.) are contrived and manipulated into existence and onto our calendars and psychological sense of ‘obligation’. Why? Profit. By whom? Owners of corporations pocketing the profit. Valentine’s Day is definitely a “Hallmark Holiday”, existing primarily for commercial purposes, i.e. profit, at the expense of the environment and peace of mind. Thank you, Ellie. Yes, these so-called ‘holidays’ are mostly contrived and invented in the western countries to sell products and make money for the corporations. Nothing wrong with buying and selling and making money though, AS LONG AS IT supports honest people all along the chain. Look for local is my motto. Support ‘Fair Trade’ labels, organic labels and above all, question the source and the motives/intentions behind any and all holidays/events/products/marketing/etc. Love expressed with integrity!